"We greatly appreciate all the fan support for Toonami Jetstream over the past years. Starting January 30, Naruto will make its new home on CN Video at CartoonNetwork.com. Fans of MAR, Blue Dragon, and other popular Viz Media series previously featured on Toonami Jetstream should check www.viz.com for future updates." Sad to see yet another subsidiary of Toonami go. I never had the chance to enjoy Jetstream, but I was a veteran of ye' old Toonami block--back when the shows were good. "It's an eprom with custom packaging, everything looks like a real sega release, but it only came out in the europe and japan. I didn't do it (solder), I bought it off someone from the sega-16 forums. From what I can tell it uses an eprom with the euro wily wars on there with the game genie region patch applied, then soldered into a nba jam tournament edition game or similar since it uses a specific type of save feature. He made the art and manual himself." Simply put, the cartridge was homebrewed--a fine homebrew at that. Thanks for the info Hypercoyote and Jesse. From the sprites to the isometric camera angle, Otodamster for the Nintendo DS appears to be an EXE knock off, but in actuality, it's far from it. 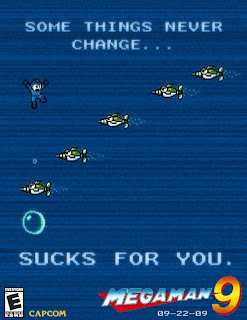 Other than the graphics, Otodamaster has nothing in common with Rockman. What is it? Otodamaster involves the act of catching various monsters for use in combat. Sounds like Pokemon, right? Sort of. From here, things get really interesting: in order to catch creatures, you have to utilize the DS microphone to pick up sound. Simply hold up your DS to a barking dog, a car horn, a blender, or anything that makes noise to successfully make a catch. The better the frequency, the higher chance of a catching a desired creature. Unfortunately, the title has yet to see a release outside of Japan's shores. 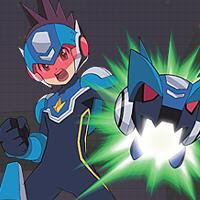 Capcom of Japan have recently updated the Shooting Star Rockman 3 website with a brand new section devoted solely to Wave Masters 2009. Here, you can view four matches recorded from the World Hobby Fair. Simply click on one of the four images and the video player up at the top of the page will load it. Simple. Another week, another sales update. According to the recent Famitsu sales data (via VGChartz), SSR3 sold a total of 2,500 copies this past week thus bringing out culminative sales to 190,665--almost at 200,000. Sales are gradually slowing down as the weeks go by, so the game is definitely showing signs of peaking. Up for bidding on Yahoo! 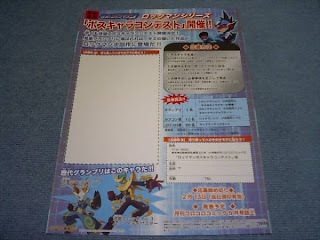 Auctions Japan is a fairly rare "Rockman smart card," a promotional item only available to members of U-Capcom for a limited time. That's pretty neat, but what the heck is a "smart card?" Since the new millennium, Japan has grown accustom to the use of "smart cards," a new method of paying for railway transportation. It's quite simple: your railroad tickets are already prepaid, and with a quick scan, you're on your way to your desired destination. In some cases, the smart card also doubles as a credit card for use in various stores and kiosks. "Themed" smart cards are nothing new, many cards are adorned with fictional characters such as Doraemon, Duke Toga, and in our case, Rockman. The auction is currently running at 1,100 Yen ($12.00) with two bids (the card originally sold for 500 Yen). In addition to the card, the seller is also included a special message from U-Capcom. Rumor: Faulty MegaMan DVD Collections? "I don't know whats going on, but the third disc of the collection is faulty, it never plays. I tried it on all my DVD players including my PS2...nothing. I'm preparing to contact amazon tomorrow." Maz is also suffering from the same issue, however he notes the disc only works on his laptop. So, what's up? Do we have a faulty product on our hands? I haven't had any issues with my set, so I wonder if this problem is limited to a certain percentage of discs. Any issues on your end? If you've yet to play the PSP ports of the series and have $35 laying around, by all means purchase the pack. Where Did Ryuusei Go Wrong? It's no mystery the Ryuusei/Shooting Star series isn't nearly as successful as its predecessor both commercially and critically, but why? Why is the series looked down upon and ridiculed by so many? As I see it there is one big reason: Long time EXE fans were turned off by the restrictive, overly simplified battle system. The EXE games contained a very complex, tactic like system where one could utilize Battle Chip "codes" to create unique play styles. This system offered a broad range of depth and variety with limitless combinations. In addition, players were free to utilize a 3x6 grid to avoid attacks or execute specific strategies for the kill. Unfortunately, SSR stripped the player of these mechanics by limiting one's movement to a single row and disposing of the Battle Chip code system in favor of the overly simplified "color coded" system. Sure, the system can be viewed as a bit more accessible than the coded system, but to EXE veterans, it was a a huge step down from the variety and depth of the former. Thankfully, SSR3 introduced a few new bells and whistles to make the battle system a little more complex, however it still doesn't hold a candle to that of its predecessors'. That said, where do you believe the series fell short? Why could have Capcom done to make the series better? I'm a bit bewildered as to what exactly this is, but one thing is for sure: you guys will be all over this one. 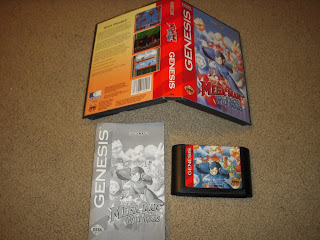 Ebay is hosting an auction for an english version of the Wily Wars for the Sega Geneisis. Yes, the Genesis--not the UK variant, the Mega Drive. As you may (or may not) know, the Wily Wars was only available to North America through Sega Channel, a now defunct online distribution service. The game was never released as a hard copy here, but saw a cartridge release throughout the UK and in Japan. 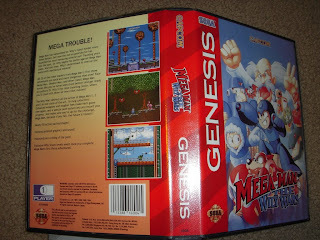 For auction is a US Genesis Mega Man Wily Wars, it is a conversion with region lock out removed of the european version, so it works perfect on all US consoles with save feature as well. Fully in english with high quality insert, sticker and manual. It is in near mint to mint condition. Shipping within the US is $6 and $25 elsewhere in the world. For a mod, somebody really went all out. Just look at the manual--they even went so far as to include Capcom USA copyright and warranty information. Seriously, is the a custom mod or something much grander? You can view the auction in question right here. Current price of 1,000 Yen (1,200 Yen buyout). No bids. Currently at 120 Yen, three bids. Currently at 4,000 Yen (s,000 Yen buyout), no bids. Current pirce at 800 Yen (1,000 Yen buyout), no bids. 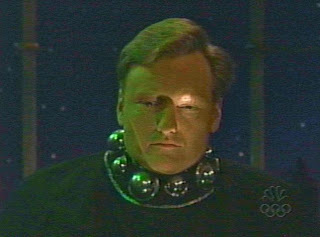 Been a little while since we had some TvC news, eh? Capcom's official TvC website has added a wallpaper section wherein one can download several TvC wallpapers featuring an assortment of characters. Rock Volnutt and Roll are featured in one, paired up alongside Yatterman No. 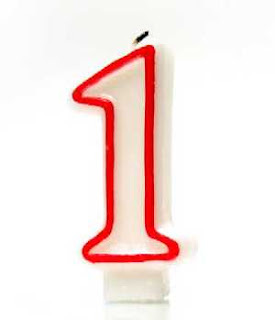 1 and Casshern. It appears that Capcom is looking to announce future DL titles in a more conventional matter, so if future DL MegaMan games come to be, we'll hear about it from the pages of game magazines or industry events. Nifty. Dengeki Online has uploaded a ton of World Hobby Fair photos, including some shots of Capcom's booth. Before taking a look at the gallery, take a good look at this photo in particular. Look familiar? You bet. It's the promotional image used in the Nintendo Dream teaser from way back. Capcom sure is hyping whatever game is coming... How much longer will we be teased? 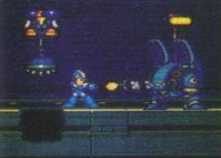 Is This What's On the "MMX Demo Cartridge?" According to "Matt," the cartridge contains an abundant amount of glitches particularly the inability to die by inflicted damage: X's health never decreases nor increases however, you can still die by falling into a pit or coming in contact with spikes. Further oddities include fewer enemies, no Armor Capsules, Heart Tanks or Sub Tanks. Pictured is a tiny screen grab of the game. From the looks of it, it definitely appears to be some sort of early build. Notice anything different with the lamp post? I sure do. Matt promises to do a follow up, hoping to get some video footage and even ripping the ROM image for distribution. Stay tuned. Boss Designs: Care To Share? It's really great that us gaijin have a chance to enter Coro Coro Comic's mysterious boss design contest. That said, are you seizing the opportunity? I'm happy to announce that I'm partaking in the contest with my very own design. 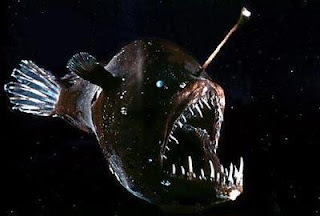 I haven't sketched it out yet, but I'm thinking along the lines of a Maverick by the name of "Jet Angler" themed after one of the creepiest fish in the sea (pictured). I'll go into more detail later, maybe even post up the finished sketch one day. So, how about you guys? Care to share your designs, ideas, sketches? Strangest Nico Nico Douga video yet: Gate teaching Axl and X about bra sizes with a little help from the ABC's. Yeah. Yup, one year ago today I hesitantly initiated PRC. 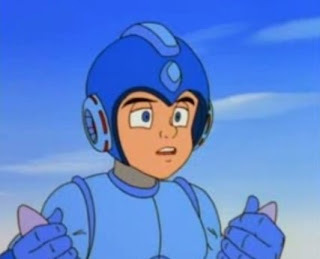 I say hesitant because I was unsure as to how well the site would fare against other, bigger MegaMan/Rockman fan sites. Far too often, little blogs like PRC are forgotten, swallowed up into obscurity. So, here's to you the readers, thanks for dropping in! The flier contains no new contest details, though it's kind of hard to tell due to the quality of the image. By all means, please feel free to make out the little details. 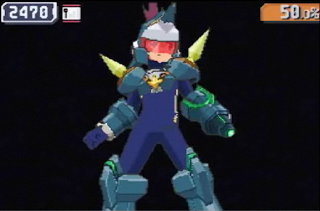 As in the previous games, MMSF3 is a unique blend of action and role-playing game (RPG), combining the high intensity combat that is the hallmark of Mega Man® games with Star Force’s strategic battle system. By defeating enemies and boss characters, players earn “battle cards” that enhance and evolve Mega Man’s abilities and attacks. 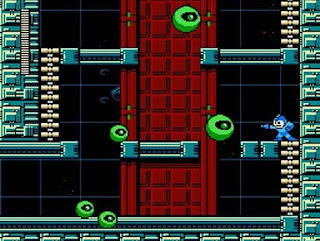 New to MMSF3 are “Noise Changes,” random enhancements that change Mega Man’s form and unlock new abilities. 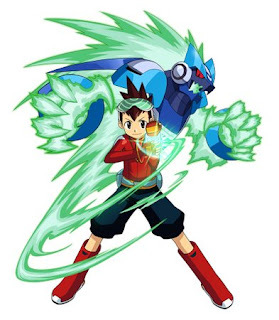 The two versions of the game, Black Ace and Red Joker, each have over 100 unique Noise Types that can be combined with Mega Man to unlock elemental powers based on earth, air, water and fire. The new Noise feature will add an exciting randomness to battles, encouraging players to explore, collect and battle across the digital world of MMSF3. 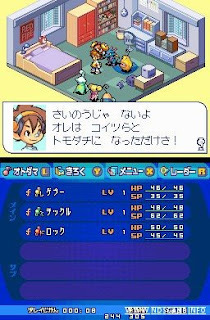 In MMSF3, players will travel between the physical world and the digital world via electromagnetic waves that form “wave roads.” Geo Stelar, the protagonist of the game, can see these wave roads through usage of his unique “visualiser” tool. Once in the digital world, Geo can merge with the electronic life-form known as Omega-Xis to become Mega Man. The wave roads are being overrun by mysterious “noise” that change the player’s environment and powers in different ways. This noise is being generated by an approaching gigantic meteor that threatens both the physical and digital worlds of MMSF3, forcing Geo Stellar and his crew to fight the oncoming threat to save two worlds. Fortunately, Mega Man discovers that he can control the Noise, using the new “Noise Change” system to transform into many different forms, including the ultimate “Black Ace” or “Red Joker” forms. You can view various press assets at Snow's blog here. Here it is: The Rockman DASH Value Pack. Rather than creating a new piece of art, Capcom chose to take DASH 1 and DASH 2's PSP cover art, put them in a blender, and shazam: the Value Pack was born. Nothing too fancy, but still quite nice. As a reminder, the pack is set to ship in a matter of a few days--January 29th, 2009 for $34.95 USD. 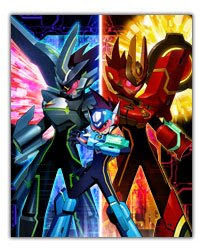 Here's hoping for a Irregular Hunter X/Rockman Rockman Value Pack! If by chance you own the PC version of MMX4, feel free to grab the hack here. UPDATE: A second patch is now available, this one includes voice clips of Mark Gatha, Japanese opening and ending songs and a few glitch fixes. Grab it here. 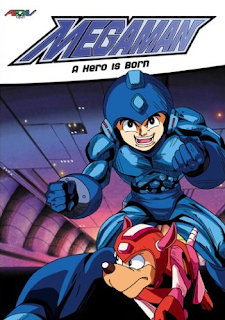 The fine folks over at NeoGaf Forums are hard at working creating fake Mega Man 9 magazine ads just for the heck of it. Ranging from humerus to serious, these ads will definitely tickle your fancy. According to the Australian Securities and Investments Commission website, Capcom's Australian distributor, Red Ant Enterprises ,will cease operations. If you may recall, it was Red Ant who registered Mega Man 9 on the OFLC ratings board, thus ensuring the rights to publishing MM9 down under. Currently, it's not known what this means for Mega Man 9 and various other titles Red Ant distributed in Australia. The company is expected to make an official comment via Kotaku AU. "Good news! We finally got more Mega Man 9 Press Kits. We still don't have enough to fill the remaining backorders but a good chunk will be shipping out to you in about a week. If all goes well we anticipate completing all backorders within a month. Thank you all for being so patient. Some of you may need to wait a little longer but we are doing our best to make certain that everyone who got an order confirmation gets a press kit. Your enthusiasm for this item was overwhelming and will ensure that we continue to dream up crazy ways of showing how much we appreciate the loyalty of our fans." Good news indeed. Hope you guys get yours sooner than later! Yahoo! Auctions Japan, home of everything a Rockman collector could ever want, is hosting two very interesting auctions that might interest you. A lone individual is auctioning off the insanely rare Rockman 4 and Rockman 5 gold cartridges—items issued as prizes for winning Robot Master design contests back in the day. 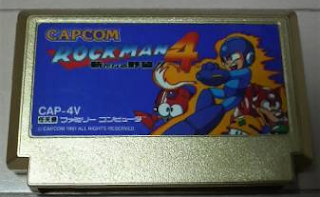 Only eight copies of the Rockman 4 cart exist, two of which we know their exact location: one resides in the company of Japanese game store Super Potato (retailing for $6,000), while the other is said to be in the hands of Bright Man's (RM4) designer. As for the Rockman 5 cartridge, I personally had no idea a gold cart version even existed, so I guess we can assume eight of those exist as well. With a starting price of 1,000 Yen each ($11.00) and zero bids, I highly recommend dropping the money on either of the two, but please do take into consideration that these may or may not be legitimate. The starting price alone makes me feel very uncomfortable, almost as if these are intended fakes. Still, there is a strong possibility these are legit and the seller has no real understanding of how much these are worth. I don't know, It's your call. 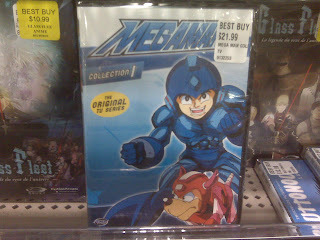 Looks like Best Buy is selling the MegaMan DVD collection ahead of schedule--nine days ahead to be exact. During a small shopping spree, PRC OmegaThantos, stumbled across the collection at his local Best Buy and picked it. So, what does the set have to offer? Not much. As expected, this is an exact replica of the 2003 version, The only differences being that it comes in a single DVD case with new box art. The book is set to release in late March, 2009. Thanks John for the tip. It's amazing what one can find when they clean up their basement. 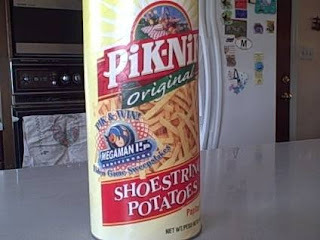 Yesterday, I stumbled upon a very old (empty) can of Pik-Nik fries that featured MegaMan on its packaging. Lo and behold, it was a promotional item I saved back in 2002. Pik-Nik foods partnered with Capcom back in 2002 to celebrate MegaMan's 15th anniversary, breaking their tradition of a "no promotion" policy. 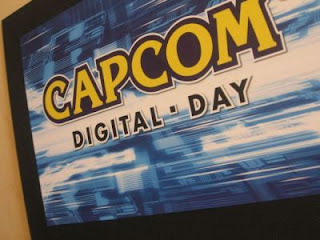 The promotion called for consumers to enter in a sweepstakes to become a "Capcom developer for a day", what became of the winners however, remains unknown (are you one of them?). In addition, winners were also rewarded a $5,000 scholarship for a school of their choosing (boy, I could use that kind of money right about now). Oh what fun! I miss these little cross promotions. 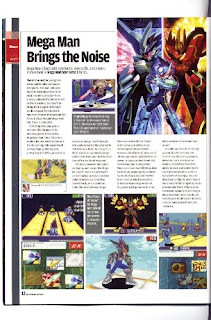 According to the newest issue of Nintendo Power, MegaMan Star Force 3: Black Ace and Red Joker, are set to release in North America this August. The NP article gave a brief overview of what to expect from the game(s), covering all the essential features we've known about for months. A transcription of the article can be found at the MegaMan Network, here. Where In the World Is Mark Gatha? Lucas Gilbertson was trying to track down Mark as well, with the intentions of doing a collaborative re-dub for fun. (according to Lucas' YouTube comments) Using his contacts, Lucas learned that Mr. Gatha is now a doctor in Nova Scotia, Canada. So, it sounds as if Mark won't be reprising his role as X anytime soon. Being a doctor is a full time job, requiring one's constant presence and diligence. Sad to see him go; Mark was, without a doubt, the best actor to ever portray X.
Showtaro Morikubo, the former voice of Rockman X (X5~X7) and Dynamo, has apparently divorced his wife/ fellow voice actress, Yu Asakawa. According to Anime News Network, the break up was a result of "differences in personalities." Well, that's a shame. 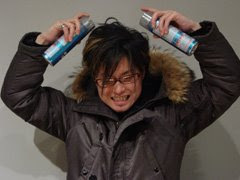 Beyond voicing X, Showtaro provided the vocals for various Rockman theme songs such as "Moon Light" (X6), "The Answer" (X6) and "Begin the Try" (Rockman.EXE animated series).
" 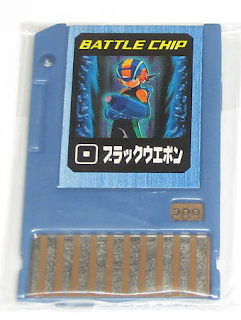 It is one of the most powerful Battle Chips in the Mega class library and was only available at a Rockman EXE event in Japan as a prize. As an added bonus, one free Battle Chip: Panel Shoot 1, is included. This chip has sold in past auctions for over $200.00 USD and is a true treasure in Rockman history. Don't let it get away; it's my only one and I WILL NOT have another one again anytime soon. " As of this writing, bidding remains at $9.95 ($7.99 shipping) with no bids. Interested? Check out the complete auction here. Want To Enter the Boss Design Contest? Now You Can! "You need to create a design with a name, attacks, other special characters, and your preference of what the next Rockman game is. Since chances are you can’t write in Japanese, you might want to keep the descriptions simple, or try to illustrate them. Then on the back you need to provide the following information: your name, age (school year), home address and phone number. If you’re feeling insecure about it, omitting the phone number should be fine in my opinion. Now, the deadline is February 13th. Once you have your letter ready, you should check with your local post office for delivery time and postage cost. International mailing can be a little pricy, especially if you need it to get there fast." In addition to the details, we also have ourselves a good look at Ghoston, the sample design created by Ryo Takamisaki. So, you guys interested in entering? Looks like Shooting Star Rockman 3's little sales spike didn't last too long: from January 3rd~January 10th, 2009, Red Joker and Black Ace sold a disappointing 5,674 copies collectively, marking an all time low. On the plus side, the game is now only 10,000 units away from hitting the 200,00 unit mark. What will happen from here? Will sales see a spike once more or trail off into obscurity? If there's one thing that Capcom has taught me, it's that they love milking Rockman's likeliness for all its worth; slapping his colorful face on anything and everything. 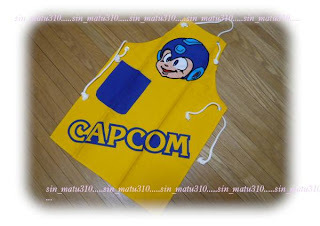 Such is the case with this stylish (and expensive) Rockman cooking apron. Yes, a Rockman cooking apron. This very obscure item is currently up for bidding at Yahoo Auctions Japan for a whopping 10,000 Yen ($115.00)! Why so much? 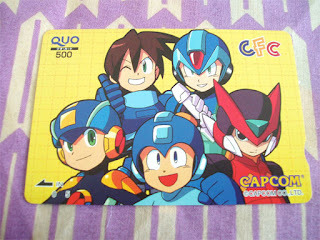 My guess is that this was some sort of under-produced promotional item, maybe something distributed only to Capcom staff? If I knew how to cook (and had some extra cash lying around), I would so buy this. 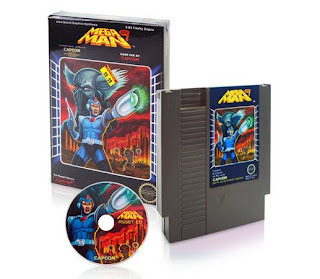 This short-legged character hides beneath a construction helmet and occasionally pops his head out to fire a trio of bullets at Mega Man. Fans of the series consider him a memorable enemy, and we loved seeing him in last year's Mega Man 9. In the middle of Dead Rising's zombie-stricken mall, you'll come across a toy store where you're able to pick up Servbot helmets. They make serviceable weapons, as you can whack the undead with them. You can also put one on a zombie's head. Do it multiple times and you've got a silly zombie party. Nothing to get overly excited about, but we have a small update regarding Coro Coro Comic's upcoming character design contest. According to Fireman, contestants actually do have something to base their designs off of. 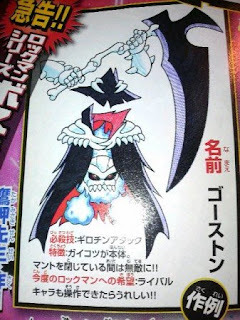 A sample character named "Ghoston," created by Ryo Takamisaki (of EXE/SSR comic fame) was displayed in the issue. No pictures at that moment, but the character is described as a "skeletal creature wrapped in ghost-like covering, with floating hands, a hat and its head is in its stomach." 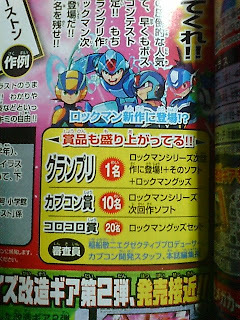 Is this an indication as to what kind of character(s) to expect from this mysterious Rockman game? I have no idea. "What is Blues Fighting For?" A fun little parody of Iris' death in Rockman X4. Here, Blues grieves over the loss his beloved Splash Woman. Bit of an odd pairing, but enjoyable. After only two chapters, Ryo Takamisaki's Shooting Star Rockman 3 manga has come to an end; possibly another sign of the series's ailing health. According to Rock Miyabi, the newest chapter of the comic comes attached with an owari on the final page, a marking used to show an indefinite end. To make matters worse, the preview for the next issue of Coro Coro Comics (April) shows no sign of the manga's return. So, how should we take this bit of news? As I see it, the manga's end is just another nail in the Shooting Star coffin, further doubting the possibility of a fourth game. In closing, you can view the final chapter here. Lucas Gilbertson Re-dubs "Death of Iris"
Japanese clothing retailer, UNIQLO, is preparing to launch a brand new campaign marketed toward gamers: UTxJapan Game. The upcoming shirts will feature characters from Sega, Hudson, SCE, Namco Bandai and of course--Capcom. Rockman's silhouette stands out like a sore thumb, so I guess it's safe to assume we'll see a Rockman shirt or two. The collaboration begins March 2009. 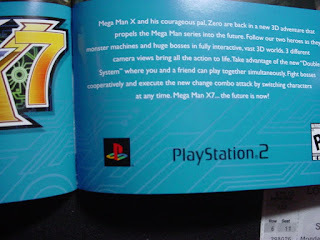 The Misinterpretation of X7's "Double Hero System"
Upon Rockman X7's unveiling at E3 2003, word of a two- player cooperative mode dubbed the "Double Hero system," began popping up throughout the internet. The system, as described in Capcom USA's press release (pictured) stated that "you and a friend can play together simultaneously. Fight bosses cooperatively and execute the new change combo attack by switching characters at any time." Contrary to countless websites' description of the game (such as GameStop), two player cooperative play was not present in the retail version. This came as a disappointment to many as they had hoped RMX7 would finally achieve the lifelong fan dream of a "true two player" Rockman game. So, What happened? It is a common belief that the two player cooperative aspect of the Double Hero system was a mistranslation/misinterpretation on Capcom USA's part. In actuality, the Double Hero system called for the ability to create a team of two Hunters who could be switched in/out of gameplay upon the player's whim to assess various situations. Proof of a mistranslation/misinterpretation can be found within RMX7's various press assets. Not once was there ever a screenshot or footage depicting two characters simultaneously on screen, not even at E3 2003. In fact, the only branch of Capcom to ever spout word of cooperative play was Capcom USA. Still, it's very possible a cooperative mode was designed but never implemented in the final version. Capcom USA's information might have been based upon an early build of X7 featuring such a mode, however this is pure speculation. Currently up for buyout on ebay is limited edition Rockman EXE 5 Team of Blues deluxe set, a bit of a rarity as very few copies were produced (Team of Colonel DX set is just as rare). The set comes in an oversize GBA box containing a copy of Team of Blues, a mini strategy guide and the rare E+Card Saito Hikari. Best of all, this particular buyout is priced at $30 (+$11 S&H), much cheaper than its original price between $50=$60. 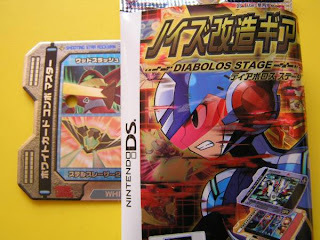 Not quite as interesting as the deluxe versions of EXE 6, but it's still worthy of a spot on your mantle. According to Best Buy's online store, ADV Film's re-release of the Ruby Spears MegaMan cartoon on DVD has been bumped up to a 3-disc set. Amazon previously listed the set as a single disc release, which seemed a bit inaccurate when you take into consideration the listed run-time of 286 minutes. Notably, the original 2003 release was a 3-disc set as well. Based on ADV's recent DVD box set re-releases such as Evangelion and Rahxephon, expect little to no bonus features. The MegaMan re-release along with Eva and Rahxephon are part of ADV's new financial recovery plan, in which they re-release their more popular shows in an attempt to make a quick buck. In order to cut production costs, they've chosen to make no effort in producing bonus features whatsoever. Got Your Press Kit Yet? 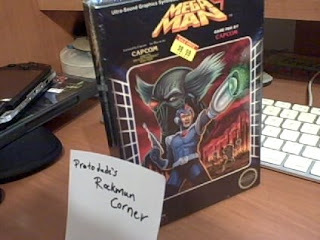 It's been three months since Capcom USA shipped out the much sought after MegaMan 9 press kit. You would think that by now, everyone who's ordered the kit are happy and content with their purchase, however this is sadly not the case for many. A good amount of people are still awaiting the package's arrival, months after a shipping confirmation notice. Some have chosen to wait it out while others are taking action, attempting to get their money back from Capcom to no avail. Where do you stand? Are you still eagerly awaiting your copy of the kit? 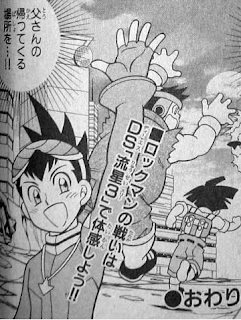 Submitted by PRC reader Thomas, one of the many Rockman "ゼERO" (Z-ERO) videos spawning from Nico Nico Douga. The bizarre video meme is quite popular among Japanese Rockman fans, so popular that it can even compared to the act of Rick Rolling. Younger readers take caution: the videos are a bit on the suggestive side. 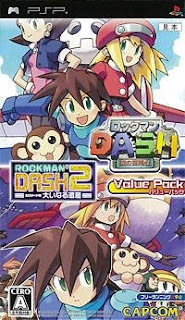 Well, here it is: the official box art for the Rockman DASH 1+2 Value Pack. Japanese online shop J-Cast brings us the pack's (small) box art along with a new price tag of 2,780 Yen (limited time only). The value pack is set to ship January 29th, 2009, regularly retailing for 3,140 Yen. It's been a long time since we last heard of MegaMan 9's sales performance, in fact, we've yet to hear how the game's been holding up in Japan--until today. According to VGChartz, MegaMan 9 (WiiWare version) has sold a grand total of 231,500 units worldwide as of December 2008. In North America and PAL regions, sales remain at 100k each while Japanese sales total to 94k. (math seems a bit off...) In the end, the title has brought in a revenue of $2,541,000. Not bad! Unfortunately, MM9's total sales across all three home consoles (Wii, 360 and PS3) remains unknown at this time. Alright, here we go: a preliminary translation of the Coro Coro character design contest courtesy of multiple people. First and foremost the article does not outright say a series will be revived, however there is a possibility the contest pertains to a new installment from a inactive series based upon the fact that there are no specifics regarding what kind of character to design--it's all open ended. This could relate to something old or something entirely new. We don't know at this point. That said, Coro Coro will officially unveil the contest details on February 13th, 2009. The judges for the contest will be Keiji Inafune himself, Capcom development staff, and editor of Coro Coro Comics. The winner will be announced in Coro Coro's May issue (coming in April). 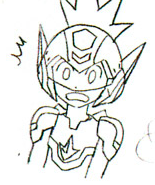 First prize winners will have their character appear in a "new Rockman story" and receive oodles of Rockman goods. 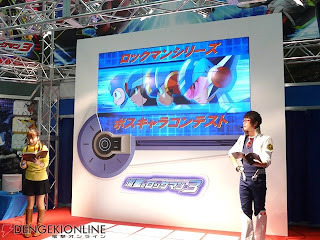 Second place winners will receive Rockman goods and a special Coro Coro item. So pretty much, this contest could be anything. Let's wait and see! "[rotsukumanshirizubosukiyarakontesuto] super 催 Already [bosukiyarakontesuto] opening decision. Of course the grand prix work is appearance in the lock man series next work. There is contest information even with WHF [kapukonbusu]! The deadline February 13th, probably will write also the demand to the next work on the postcard. As for some series the pattern which has not been decided. In other words if you send the boss of the series which is wanted issuing the continuation (ry You will apply to [a] DASH and X? " Bear with me on this. We're going to have to wait a little while until a concrete (and accurate) translation surfaces. Please don't take my translation as fact...I'm not all too fluent with moonspeak. 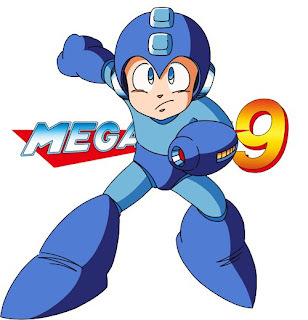 You loved Mega Man® 9, the break-out retro hit game, and now you don't have to play Mega Man® 9 to enjoy all the classic video game 8-bit nostalgia. 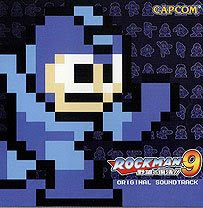 Play your favorite songs and sounds from Mega Man's triumphant return to 8-bit with the Mega Man 9 Original Soundtrack! Imported directly from Japan. -10 page booklet including original character art, all in color! Note: The liner notes are in Japanese. New Years postcards are a big thing in the east, it's not uncommon for game developers and artists to create "nengajou" for their devoted fans. Thus, to commemorate the new year, Hitoshi Ariga has crafted a nifty negajou card entitled "Asteroid Blues" for all his viewers. How nice! 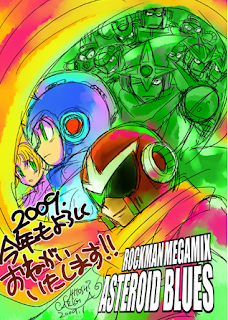 Coinciding the new year card was a small status update concerning Megamix volume 4: Ariga notes he's working very hard on the comic's completion, apologizing for not being able to speak about it more directly. Apparently, Ariga is not allowed to make any sort of announcements, instead all announcements shall come from his publisher in the near future. Regardless, he's anticipating the comic's release later this year. 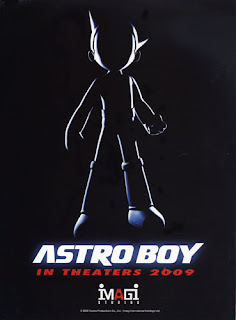 Jazwares Inc., makers of various MegaMan action figures and play sets, was recently awarded the rights to the upcoming Astroy Boy CGI film. According to a post on the official Jazwares forums, the company is looking to involve fans in the line's production. Coinciding the announcement, Jazware's official site has added a "coming soon" banner for the toy line, implying an upcoming section solely for the toys. Expect more details and pictures of the toys in the near future. Courtesy of Arashi120, we now have our first new banner. Due to template restrictions, the banner won't run the full length of the blog on some monitors, thus it appears as if it's been cut off. Fret not, I'm looking into it. Thanks again for the banner Arashi120. Hopefully, more to come! This one is a given. With Capcom's announcement to speed up their PSN support, there's no doubt we'll be seeing one or two of the PSX Rockman titles hitting PSN. As for the Virtual Console, we'll most likely see Rockman 4~6 scattered throughout '09, but what of Rockman X? I believe if Capcom were to create a new X series game this year (more on that in a moment), we'll definitely see the X series niche its way into the VC to build hype for the new title. It's coming alright, hopefully this year. Demand for X9 is definitely there and Capcom is well aware of it. As for the possibility of it being 16-bit, I say it's a no go. The X series is well known for its technical progression, evolving its graphical engine with every console it appears on. Downgrading all the way back to it's 16-bit roots just doesn't feel all too right. I believe if an X9 came to be, it would utilize the under appreciated Irregular Hunter X engine: it's not overly 3D nor is it too 2D: it's just right. 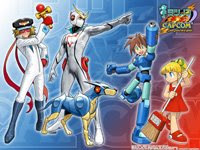 3) Co-existence of the Shooting Star Rockman and EXE series...Huh? After the less than stellar sales of the entire SSR series, Capcom might be looking to revitalize the EXE brand for the sake of printing money, regardless if the story is over or not. The SSR series however, won't completely disappear rather, we'll see a few measly cell phone titles (e.g "Legend of the Network") and some SSR branded goods just too keep things alive. If the upcoming boss contest isn't related to a new EXE game, it may have something to do with a third SSR3 version with the character contest requiring readers to submit designs for a secret boss or something along those lines. But, why a new version of SSR3? Isn't two enough? Well, as you may know, SSR3 is trailing behind its predecessors in sales, thus to recuperate any sort of financial loss, Capcom might release a third version with all sorts of bonus content and director's cut stuff; just enough material to garner some interest in purchasing the game a second (or third) time.